NAZI PARTY & ADOLF HITLER - Third Reich, Nazis, Fascist Party, Swastikas, National Socialist German Workers Party Nazi http://rexcurry.net/fascism-third-reich-hitler-nazism-swastika456.jpg Left Wing, Right Wing, Liberal, Conservative? FASCIST PARTY, THIRD REICH, NAZIS, NAZISM: Left Wing or Right Wing? Liberal or Conservative? Was the National Socialist German Workers' Party inpired by the U.S.A. ? 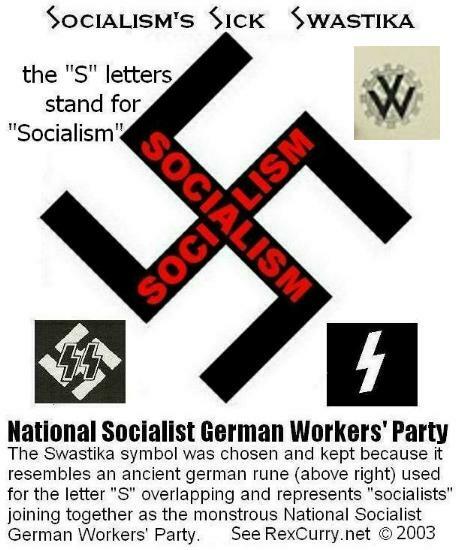 Was the National Socialist German Workers' Party influenced by the U.S.A.? 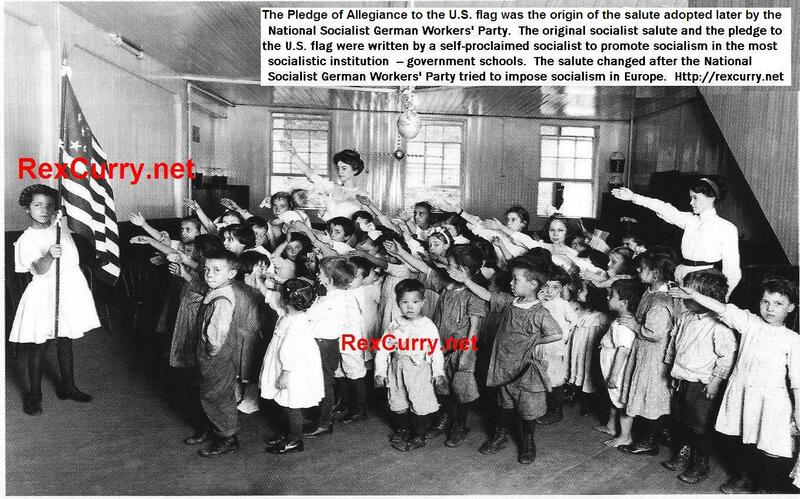 In 1940, in Minersville School Board v. Gobitas, the Supreme Court ruled that a government school could expel children for refusing to perform the straight-arm socialist salute to the U.S. flag. The National Socialist German Workers’ Party had been in existence since 1920 (with electoral breakthroughs in 1930 and dictatorship in 1933, and WWII in 1939). About three years later (1943), in West Virginia Board of Education v. Barnette the Supreme Court reversed itself and decided that school children may not be forced to stand and salute the flag. The U.S. salute was so similar that the U.S. changed its salute after the monstrous National Socialist German Workers' Party tried to impose socialism in Europe. Francis Bellamy, the author of the pledge, was the first cousin of another socialist, Edward Bellamy. Edward Bellamy's futuristic novel, "Looking Backward," published in 1888, described a totalitarian Boston in the year 2000, that Edward Bellamy portrayed as a utopia. The book spawned a socialist movement in Boston known as "Nationalism," whose members wanted the federal government to nationalize most of the American economy. Francis Bellamy was a member of the "Nationalism" movement and a vice president of its socialist auxiliary group. The self-proclaimed socialist Francis Bellamy proposed the original socialist salute and the pledge after he joined the staff of the magazine "Youth's Companion." 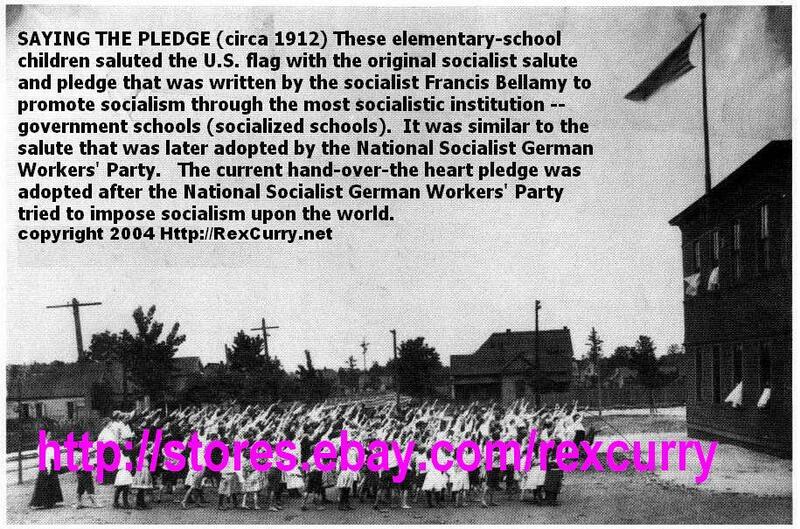 The salute and pledge were created by Bellamy to promote socialism among the youth in the most socialistic institution -government schools. When the U.S. Constitution was written, most children received private educations. Bellamy lived during the time when schools were becoming socialized heavily in the United States. Bellamy believed that the best way to promote socialism was by removing children from their parents and placing them in socialized schools (government schools) and other youth groups. It was a view later shared by the National Socialist German Workers' Party and its youth programs. NAZI Left or Right? Conservative or Liberal?